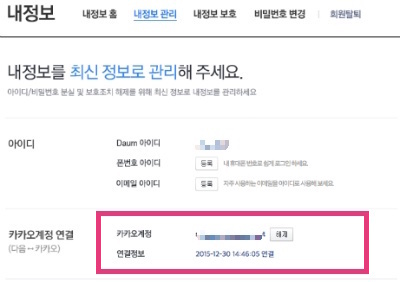 1 What is a Daum ID linked to Kakao Account? Open the content area. 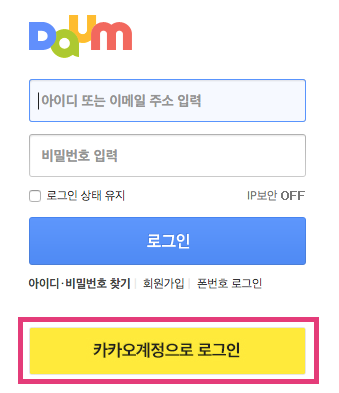 Now you can log in using your Kakao Account instead of your Daum ID to use Daum services. From the Daum Login screen, you can sign up for a Daum account by choosing "Log in with Kakao Account". 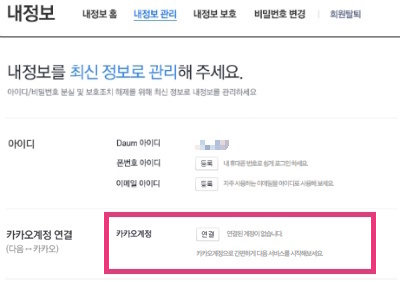 Or, if you connect your Daum ID and Kakao Account in My Account in Daum, and you will see the Daum ID linked to your Kakao Account in Kakao Account > Manage Connected Services. When you click [Log in with Kakao Account] in the Daum login screen and log in with your Kakao Account, you can use Daum services via the linkd Daum ID. 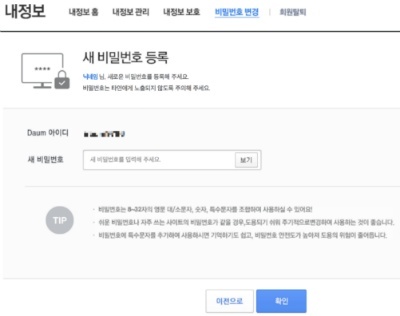 2 The linked Daum ID shown in Manage Connected Services is not the ID I frequently use. How do I change it? Open the content area. 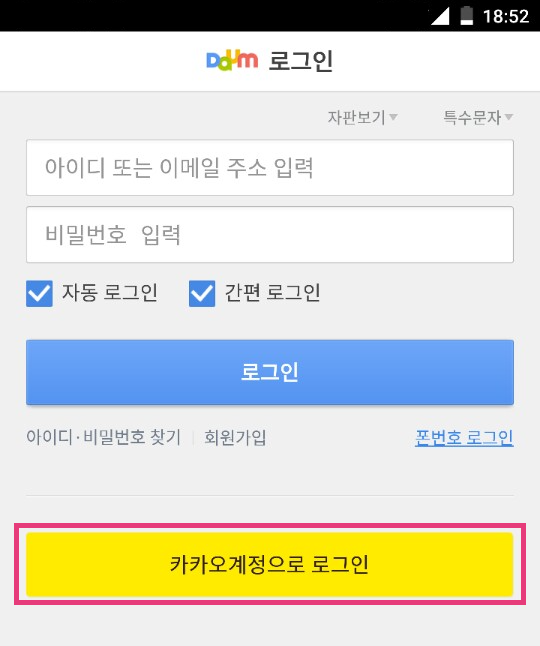 If the linked Daum ID is not an active Daum ID, you may have created a new account with Daum. 2. Disconnect your Kakao Account in My Account. 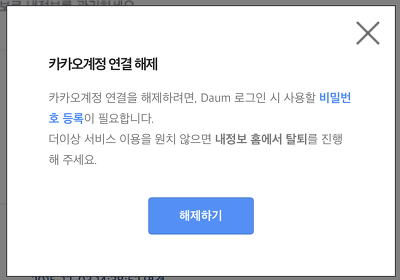 If you have never set a Daum password, you must set a password during the disconnection process. 3. 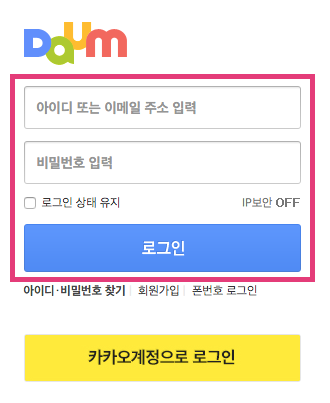 Log out of your Daum ID, and log in with an active Daum ID. 4. Connect your Daum ID and Kakao Account in My Account. * If you already logged in with your Kakao Account, login page can not be displayed. 3 I don’t want to use Daum services using my Kakao Account. How do I disconnect it? Open the content area. 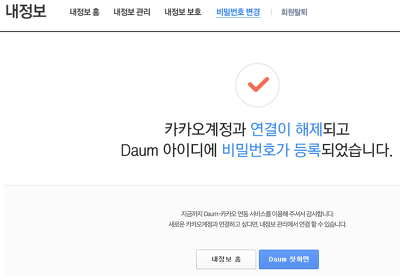 There are two ways to disconnect your Daum ID from your Kakao Account. 1. Disconnect your Kakao Account in Kakao Account > Manage Connected Services. 2. Click [Log in with Kakao Account] in the Daum login screen and log in with your Kakao Account, Then, disconnect your Kakao Account in My Account. 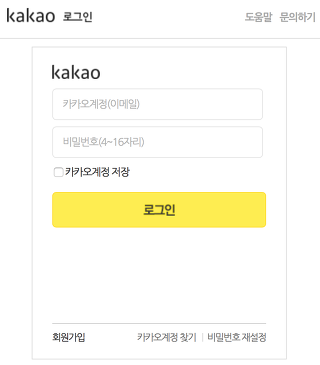 Please note that you cannot disconnect your Kakao Account in Kakao > Manage Connected Services if you don't have a password registered with your Daum ID because you have signed up for Daum using your Kakao Account. In this case, you can use Option 2, and will be asked to register a password during the disconnection process.